Inside Secure TLS Toolkit (formerly known as MatrixSSL) is a TLS protocol implementation in C language with minimalistic system dependencies making it easily portable on any platform. Inside’s TLS Toolkit powers millions of products ranging from embedded devices with very limited capabilities to high-end network equipment. GUARD TLS Tiny allows IoT devices such as garage door openers, light switch, medical sensors, to use very cheap microcontrollers while securely connecting over internet. GUARD TLS Tiny is designed for 8-bit microcontrollers to 32-bit microcontrollers with extremely limited memory that use remote connections, and demand robust security. This proven and secure TLS stack is delivered in portable C source code. To select the right level of security, one need to think about what needs to be protected, and then apply the security at all necessary levels. Sometimes, when a the data link cannot be trusted, security must be applied on the network level. For example, VPN are often used to protect devices from being attacked from the local untrusted WiFi network. Such attack may be due to another computer on the same WiFi, a compromised wireless routers (and hacking tools like Mirai have shown how vulnerable they are) or a rogue Access Point. For high security, a VPN is used to force all traffic to and from your device through a security infrastructure such as the Intranet security or a SECaaS cloud. Such infrastructure would analyze all traffic to prevent malware to be accidently downloaded and to detect abnormal traffic patterns. 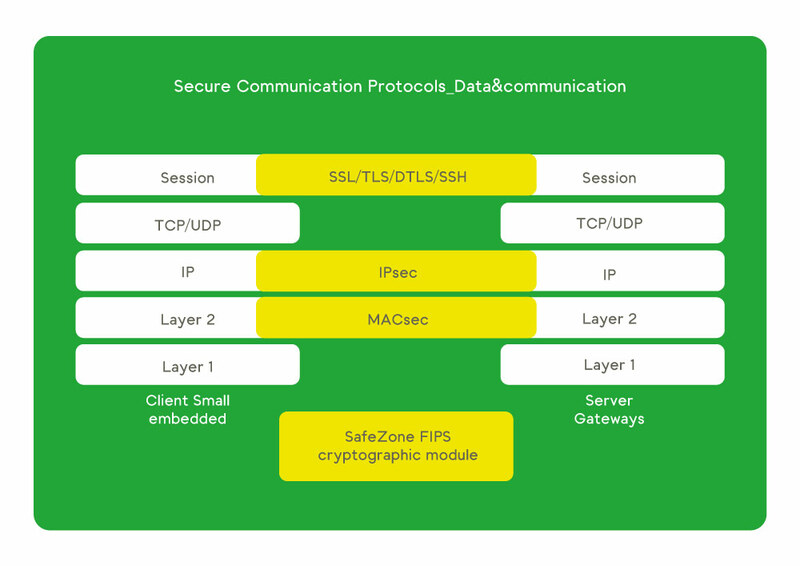 Application level protocols like TLS are great to protect traffic from e.g. a banking application to the banking server. But they do not protect data within the application, so technology to secure the application themselves are also needed (see application protection section). In addition, if the application uses the TLS implementation from the device, a compromised device may intercept or modify the data before transmitting it. - Available with a FIPS140-2 certified cryptographic module upon request.